Discussion in 'Other Militaria' started by Otto, Jan 19, 2019. Got this stuff. relic German rifle grenade,Japanese Officer wool hat,Officer canteen cup with compass,E.M. canteen,Type-4 grenades,saki cups. Rich A. in Pa.
With the amount of great items which Rich picks up, I'm starting to wonder if Japan actually invaded Philadelphia - but no-one's told us ! Otto and formerjughead like this. To the Stoneleigh Fair yesterday with just one item on my 'wants list'. 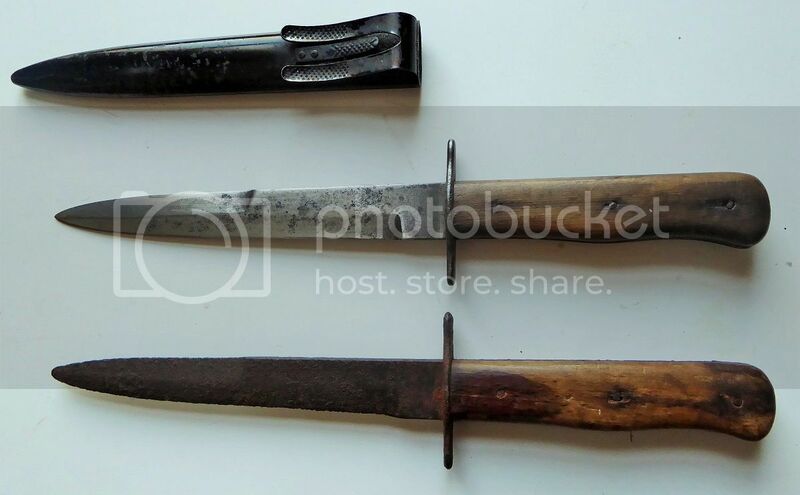 A 'proper' WWII Nahkampfmesser - AKA a 'boot knife' or simply the German close-combat knife. Warning : these are heavily reproduced/downright faked ! I had one advantage - my first one ( lower in the pic below ) I know is real - because I bought it 22 years ago from the farmer on whose outbuilding windowledge it had sat for dcades ( not far from St Vith in the Ardennes ). 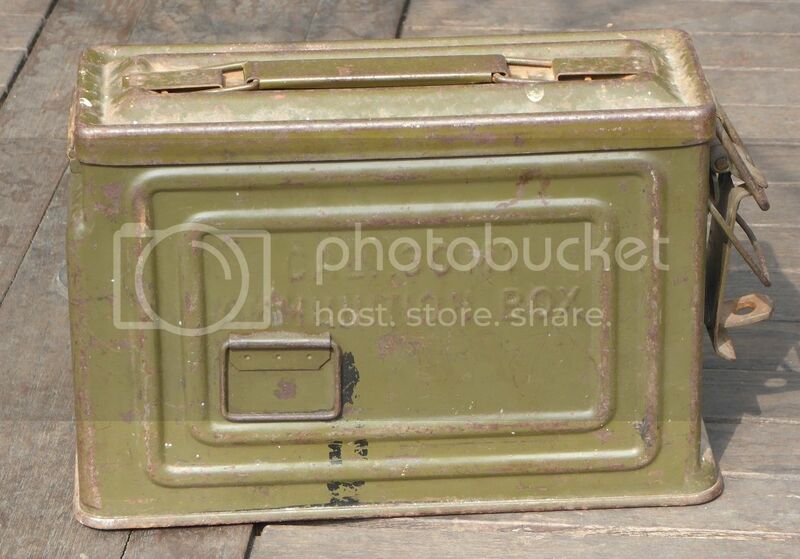 I'd often hankered after getting a similar one in non-relic condition. You see them at nearly every Fair ( always in a glass display case, so you know you're not going to get a bargain ). And I knew that these can be a trap for the unwary. So I've done lots of online research over the Winter - armed myself with my relic knife plus a magnifying glass and plenty of cash, and off I went. I must have studied a dozen knives yesterday varying from absolute mint ones, to obvious reproductions, at least one total Pakistan-made fake ( and every dealer was very keen to make a sale - how many times did I hear 'I'm selling that one from my personal collection' ? ). And prices which varied by hundreds (!) of Pounds. L5 or L6 code Luftwaffe knives? Rich A. in Pa. The relic knife has just too much rust to show a marking. The one I bought yesterday has a '6' acceptance mark. 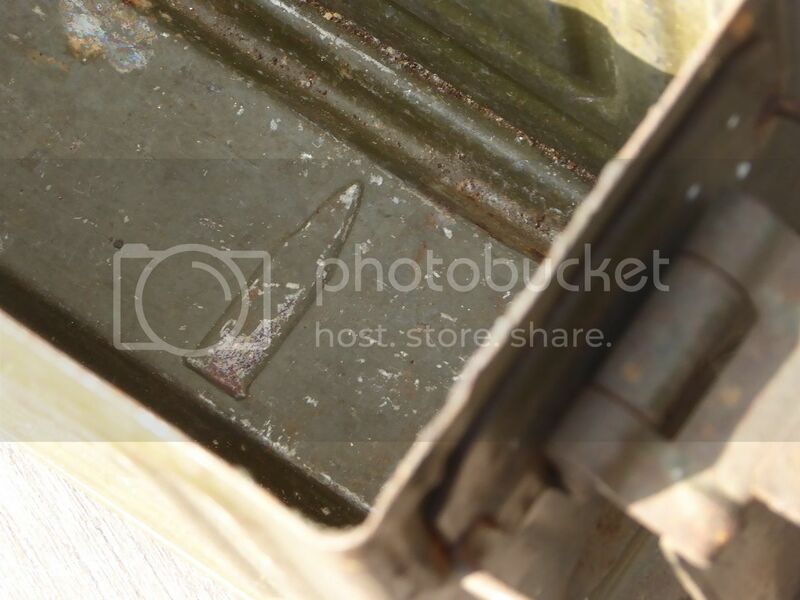 I picked up a second WWII era ship's battle lantern, to restore. Already had one. I've been collecting Navy handleless coffee mugs too. Got 21 of those so far. For other stuff that I've had for a while; a chunk of teak from USS MISSOURI's quarterdeck, and actual oil sample from the USS ARIZONA. Post a pic of your coffee mugs. All mine have a handle. The demitass Ward Room Off. Mess cup has a handle. Rich A. in Pa. These cups, also called hand warmer mugs or watch cups were made so you could wrap your hands around them and keep your hands warm. The lack of handle also makes them easier to store. Remember, this was back in the day when the crew ate in their berthing space, not in a general mess like today. They are about 3.75" in diameter and 3.5" tall. They were made by a whole slew of companies, from the 1920's up through the 1950's. I picked up my first one off the bottom of Pearl Harbor. Got this stuff. Finland cold weather hat,copy Japanese hat,pillow cases,hankies and a Italian W.W.2 Para smock. See link for more info. Nice mugs. Thanks for posting. Rich A. in Pa.
Got this stuff. Japanese W.W.2 Type-4 grenades and relic German rifle grenade. Rich A. in Pa.
Got this stuff. Japanese Type-4 grenades,bank notes,cut down coccade and a U.S. pin and collar device. Rich A. in Pa.
Got this stuff. German M-17 grenade,saki cups,Japanese Type-4 grenades. Rich A. in Pa.
Half Track and Jba45ww2 like this. 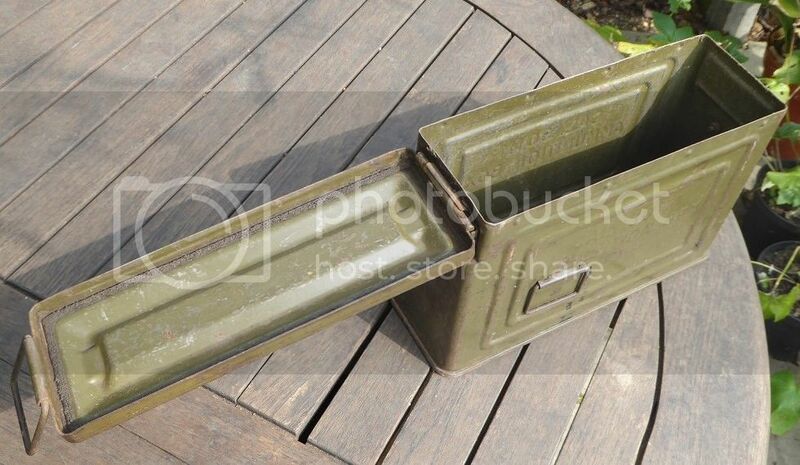 I've been toying with the idea of adding a .30cal ammo box to my collection - let's face it, these aren't 'rare' but decent ones are getting harder to find ( even rusted-out relics are going for £30+ ). Anyhow, strolling along London's Portobello Road yesterday ( no longer a great place to find antiques - it's just a tatty tourist trap selling street food ) I was amazed to find this item on one of the very few house-clearance stalls surviving. 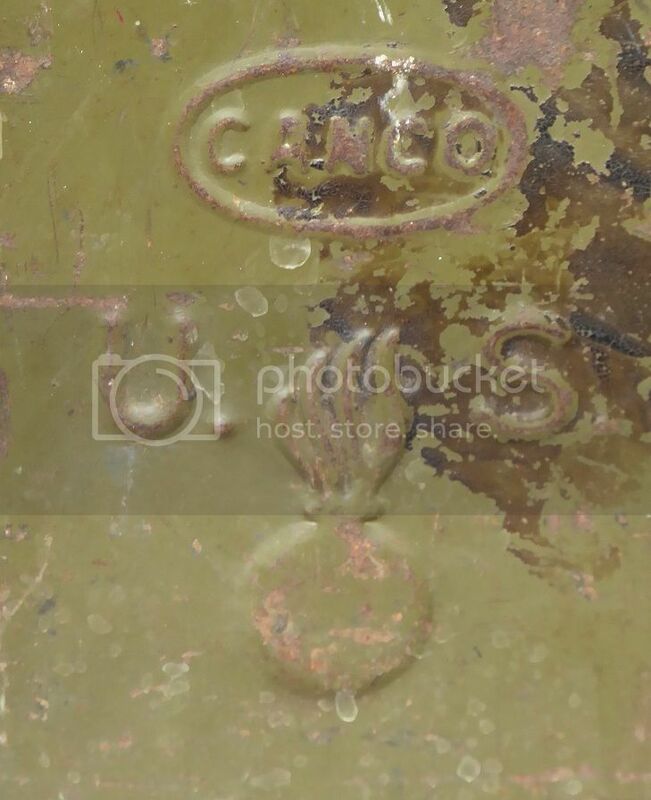 Canco-marked, flaming bomb, intact gasket, and almost no rust inside or out. How much ? Otto and Half Track like this.